The Merry Patterns stamp set is an exclusive stamp set available only during October. Any host can get it with order total of of $375. The stamp set is a Two-Step Stamping Set. You first stamp the outline of the candle with black ink and then fill in the pattern with another set of stamps. For these candles, there are two separate pieces so you can get get two colours on the candles. And there is another piece to stamp the inside of the flame. They are super easy to line up as they are photopolymer stamps. 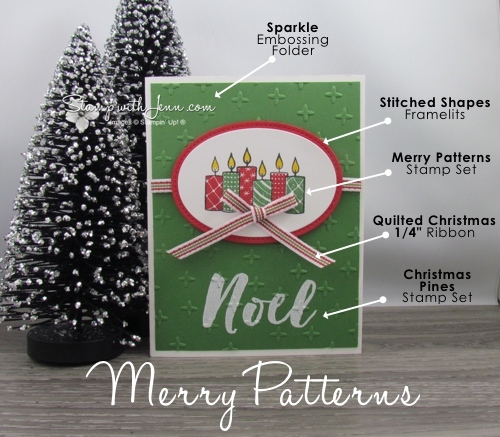 You can see more ideas with the Merry Patterns stamp set here. The colours on this card are Garden Green and Real Red. 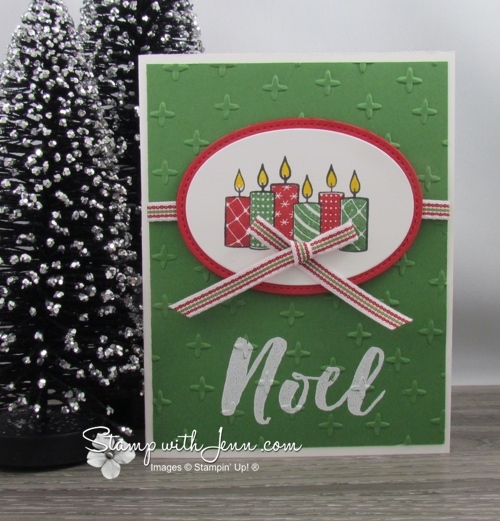 See some other Christmas colours ideas here. See the rest of the supplies I used on this card below. Gather your friends and get your orders together to earn the Merry Patterns stamp set before the month is over. l 15% off Stampin’ Up! Items or 10 days Only!